Celebrate this milestone event with these delectation graduation cookie favors! 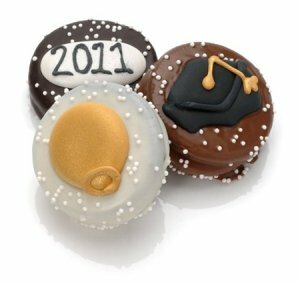 Our chocolate-covered Oreos make a great gift for your party guests, and the graduation decorations fit in perfectly with your theme. Each cookie is enrobed in fine Belgian chocolate - your choice of milk, dark, white or an assortment. We then top each cookie with sprinkles and graduation-themed edibles, and individually package them in heat-sealed bags to preserve freshness. Order enough for all your guests, or give each member of the graduating class a sweet little treat to go with their hard-earned diplomas! NOTE: Bulk items include a mixture of cookies with royal icing decor and sprinkles and cookies with sprinkles only.